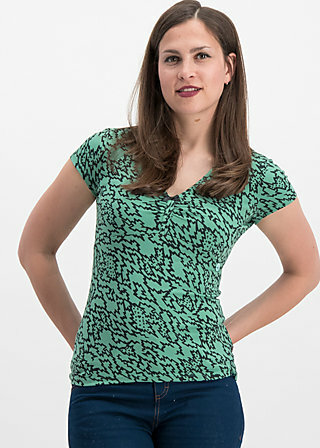 Figure-hugging tee made of a supple, high-quality cotton-spandex blend, with four Blutsgeschwister street-style prints. The cut and material make this Blutsgeschwister classic a comfortable favourite that is easy to combine and suitable for everyday wear. The feminine V-neck with its delicate edging highlights every cleavage, while fine ruffles and tailored dividing seam below the chest area add a perfect finishing touch to this jersey top. The discreet pendant near the left dividing seam not only displays our logo but also a small swallow symbolising hope, love and your personal freedom. heart, let the sunshine in and embrace the summer!